The expression "makes not one iota of difference" originates from a 4th century theological discussion about the nature of God; iota being the 14th letter of the Greek alphabet. In the 1980s BMW started putting that very same letter on the back of their BMWs, but to the discerning driver it is extremely important. The idiom actually comes from the ancient Greek homoousios (homo=same, ousios=substance) and its application in the Nicene Creed. The Trinitarians argued the Christ and God were of one substance (homoousios ), Arian heretics claimed They were different (heteroousios) and a group of Semi-Arians claimed They were of similar (homoiousios) substance. The words homoousios and homoiousios may have been separated by only one iota, but that small distinction formed a key part of the early Church foundation during the first few centuries AD and continues to this day. However, if you lived in the 1980s, the difference between an i and an e on the back of your BMW could make a world of difference, although you might not get banished from your village and subsequently burn in the eternal fires of hell...probably. 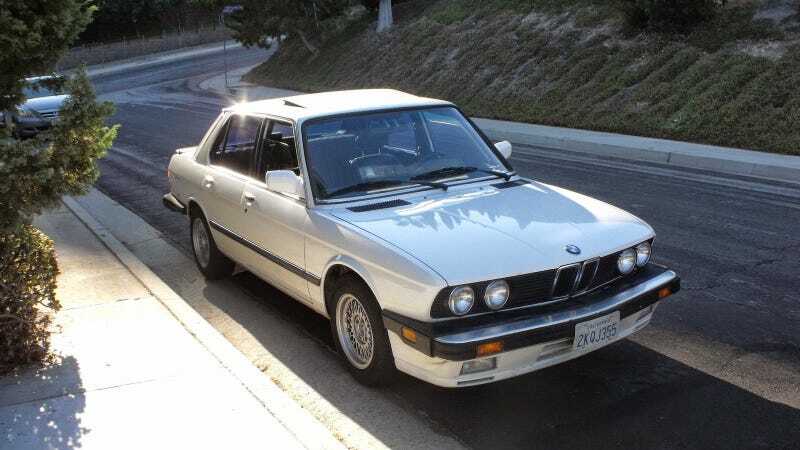 Find this 1988 BMW 535is currently bidding for $2,246 reserve-not-met on ebay with 5 days to go, located in La Crescenta, CA. You can read more about the early Christian iota disagreement at the DailyMedieval website (no affiliation to Daily Turismo, but I do appreciate the Ignatius Reilly attitude and web 1.0 style...), but we are here to talk about the BMW E28 5-series. By 1988, the non-M E28 was available in 528e or 535i trim, and the difference is absolutely staggering. Own a 528e (e was for eta or the Greek letter used by engineers for efficiency) and you'll find yourself peppering conversations with phrases like it gets great mileage, it's more fun to drive a slow car fast, it was really quite decent in 1978...sort of the stuff you'd expect a Saab 99 EMS owner to say on a regular basis. The 535i (i for injected), on the other hand, has the reflexes to dice through modern traffic and enough oomph under the hood to keep any excuses at bay. The 535is adds a few visual cues to the sporty package. The M30B34 is a 3.4 liter (ignore the 535 on the trunk lid, BMW started creativity in its naming badges during this time) inline-6 that makes 182 horsepower and 214 ft-lbs of torque. The big six is known for its longevity and basic mechanical robustness, so the 175k on the odometer shouldn't scare anyone. The 535is (s for sport...I think...) added a sport suspension, M5 costmetic bits (air dam, trunk spoiler) and M5 sport seats to the already upgraded 535i. The total MSRP in 1998 was around $38k, so it was an expensive car, but today they can be purchased for next to nothing. Originally posted as 5k: Not One Iota: 1988 BMW 535is on Daily Turismo.